We fill out a care sheet at each visit. This is something we use to make sure we cover every detail at every visit. We also leave it out for you when you get back home so you can see what we did during your visits. Your care sheet will include the date and time that we complete each visit. That is listed at the top of each column. 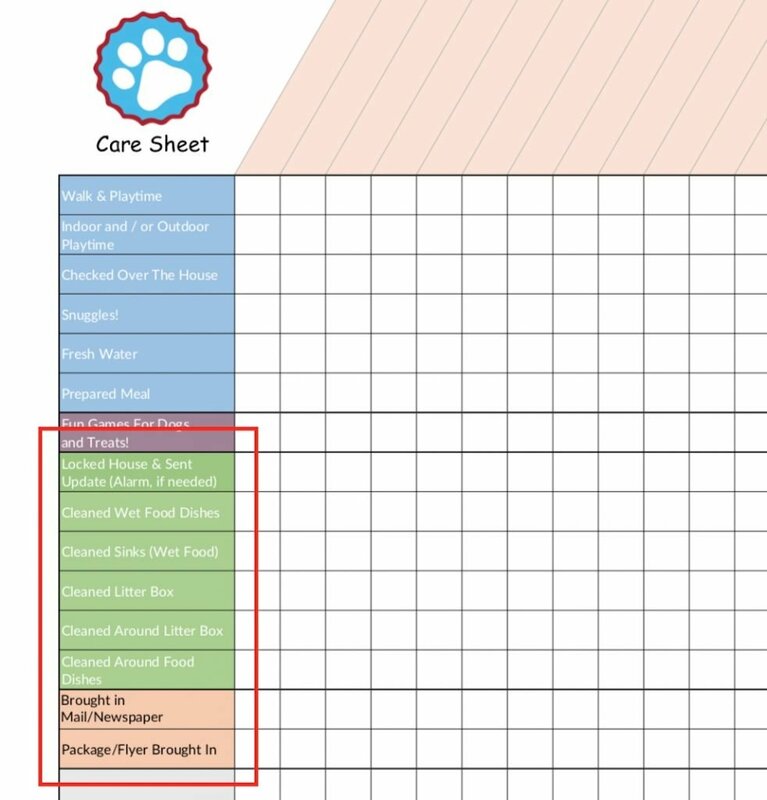 The care sheet covers pet care, house sitting, reward based games that we can play with dogs, and a section that we can customize for any special care or items that we can take care of. In this article, we will cover the house sitting section and the customize section. You sitter will write their initials in the corresponding box for each item that they complete at each visit. The green section is all about checking over your house, keeping things clean and tidy, and taking care of daily chores around the house. Let’s cover each item. Part of our checklist is locking the doors, sending you an update, and setting the security system if needed. Security is a major focus of ours. It is one of the three items in our mental checklist that complete before we leave each visit. Here is our rule for locking doors: Any door that is locked when you get there should be locked when you leave. Pets are our business and we value their safety above all. Therefore, when we have backyard playtime or are entering or leaving a home, we make sure all outside gates are secure. We also remain mindful of front, back, side, and garage doors. If we are accessing your home via a garage code, we always make sure that the garage door is closed all the way before we open up the garage walk door. We know some pets can be escape artists and we stay prepared! We send picture message updates at every visit. From every visit you will receive 3 or more picture of your happy pets! 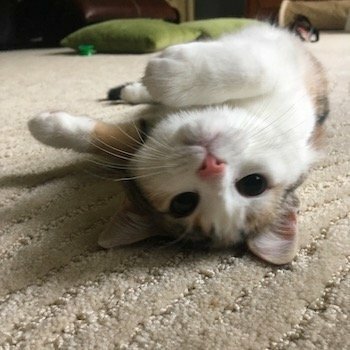 Getting a picture message is good solid reassurance that your sitter completed your visit and your pets are doing great! I believe in regular quality checks in every process. I absolutely love how a simple text message keeps everyone up to date on exactly what is going on with your visits. 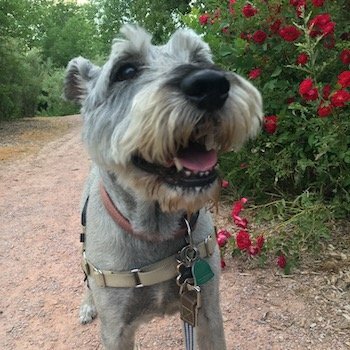 We use our service for our pets when we go out of town and the pictures let us know that everything is going well and our pets are happy! If your pets are seem like they might not be feeling well, we take a video with our phone. If a picture is is worth a 1000 words – 5 seconds of video is worth 150,000! There are some things that are not translated well over the phone or just by pictures – much less over text message. Your dog(s) or cat’s body language when they are not feeling well is one of those things. We really like that we can send video so easily these days. You know your pets best. So, sharing a video has really helped us understand if something we are seeing just happens now and then with your pets or if it is time to go to the vet. Before we send video, we will give you a call to ask you if the signs we are seeing are normal for your pet and to ask when we can send you the video. Sometimes we can sort everything out with just a quick call. We also ask if you are in an area with good cell signal or wi-fi and can receive the video. Video messages are about 20mb per 10 seconds of video, so short videos send well if you have good signal. If we are not sure about something, we ask. That is our standard, every time. Many times our office admins can help out with simple questions and for visit specific questions we will reach out to your for any clarification. If it takes more than three sentences to ask the question over text, we will text you to see if we can give you a call. If it takes more than one text to clarify something, we will ask if we can give you a call. We are always happy to set up a vet appointment if needed. I train our sitters to be confident in mentioning anything during our three way call that might be relevant to the situation. I tell them that small details can save a life! So, bring up anything you have seen. I also tell sitters if they think of something after the first phone call, let’s set up another one. It’s no big deal. Even if we said something wrong the first time, that happens – let’s go back and correct it. That is much more valuable and safer for the pets. I like everyone to get all of the information so we can make good decisions together. It’s better to mention something eventually vs never mentioning something all and having to deal with the negative consequences later. If you decide that going to the vet is the best option for your pet(s). Our office admin will set up a visit with your vet and take your pets in to the office. We can pick up any medications that are needed and set up any special care that your vet recommends. By now, you can probably tell that we have a number of standard processes. One of our main focus during new sitter training is cleanliness. Our respect for a client’s home includes leaving it as clean, or cleaner, than we entered it. We clean and dry wet food dishes in between every mealtime. We also wash any wet food cans before putting them in the recycling. If you like you can leave out extra dishes and spoons. We make sure everything is neatly stacked and dry when you get home. If we are preparing wet food for your pets, we will clean up the sing so those little bits of wet food don’t sit in the sink. We spray out the sink and run the garbage disposal or clean it up with a paper towel. We only clean the pet’s dishes. So anything left in the sink when you leave will still be there when you get home. If there are too many dishes in the sink for us to clean wet food dishes, we will not clean the sinks and we will clean wet food dishes the best we can. All pet messes are cleaned up right away. Our pet sitters and dog walkers are given standard kit that includes a roll of paper towels, Nature’s Miracle cleaner, nitrile gloves, and more. If we are unable to clean up a mess with our standard kit; such as a mess is on a high pile rug or a blanket. We will let you know in our update. We can throw items in the your washing machine and transfer to the dryer at the next visit. But, we always ask before we toss anything in the laundry. We scoop litter boxes every day. To keep your home smelling fresh, all cat litter is disposed of in outside dumpsters or in your garbage services’ rolling trash bin. We can also replace litter if needed. We will top off litter if it gets low. I train our sitters that daily cleaning is important to keep good litter box habits. Many clients hire us specifically to clean the litter box. It is very difficult to get your cat to re-learn their litter box habits once they build a surface preference for carpet. So, we clean the boxes every day. We always try to keep the amount of litter in your litter box consistent. If the amount of litter in the litter box suddenly changes, some cat’s may decide to not use the litter box. Our sitters regularly clean any litter that is tracked from the litter box. Those little bits of litter can sure get everywhere if they are not swept up every couple of days. We make an honest effort to clean up tracked litter. Sometimes we are not able to clean tracked litter if the litter box is located around high pile rugs, blankets, or other items that would need to be cleaned before we vacuum or sweep up the litter. When a pet sitter takes the time to clean up the area around the food dishes, I always think this is a mark of a good pet sitter. Little bugs and ants are attached to any food crumbs and they can start to get around and in the animals’ food if the area is unkempt. Cleaning up the little chucks of kibble or wet food around the dog or cat dishes keep that area clean and sanitary. We bring in any newspapers, mail and packages. If you have a food delivery or any refrigerator package, we can open it up and put it in your refrigerator. Some cats like to chew on newspaper bags, so we take the paper out of the bag and stack papers neatly with your other mail and packages. If we notice a note on your door from FedEX or UPS about a package that needs to be signed for, we will send you a picture of it and ask if you would like us to sign the slip. Your plants need love too! Along with taking great care of your pets and your home, we pay special attention to your plants. I’ll admit I am certainly not an expert when it comes to the name of each type of plant. It is very helpful if you describe plants by their location. That helps us find each of your plants too. We are happy to water gardens. Please understand that it may take a longer visit to do a good job in watering large gardens. You can mix and match your visits. Sometimes just adding an extra 15 minutes on days you would like your garden to be watered works well. We are happy to help taking trash to the curb! In your welcome packet, you will find a Trash Day Reminder that you can leave out for your sitter. It is easy to fill out and is very helpful for your sitter. Many clients like to add a few custom items to their visits. We can cover your daily routine. Almost every visit has a custom item for the pets or a clients home. Let us know how we can help. We do a walk-through of the house during each visit. During our walk though we go into the rooms in which the pets have access to. Any doors that were closed upon our arrival will remain closed while we’re there. Over the years we have found this is an important part of every pet sitting visit. We want to make sure that everything in your home is looking good. We check for pet messes and anything else that is out of the ordinary. Our clients have felt like we have gone above and beyond with our house sitting duties, but we consider it to be part of our job. In fact there have been a couple instances a pet sitter has noticed a wet spot in the ceiling – and down comes a little drip. A bit of diligence by our staff has saved our clients thousands of dollars in potential water damage. I encourage my sitters to bring up any detail that is relevant during conversations with our clients. If needed, our office admins will go to your home to get a better understanding of the situation and update you with more detail. We keep you in the loop every step of the way. If we need to take any action, we can set up whatever you need. It is rare that we would need to, but we can assist in scheduling and meeting with plumbers, contractors, window repair, or any other service you need. Our systems that we have in place to make sure your home and pets stay secure and safe, are pretty awesome. But we continually build in contingency plans and sure up processes. We not only do 5-whys and other root cause analysis whenever something goes wrong, but we look at our processes when things go right too. This way we can try to repeat and build on what we have done well. My background is in Industrial Engineering, SixSigma Quality Control, and of course Pet Care! And it shows with how we focus on continuous improvement, zero mistakes, and consistent service.